UKQRM | Your stories of QRM issues and how you resolved them. Detailed below are people's personal experiences of radio interference and the processes they had to go through to try and achieve interference free radio listening. We would love to hear from you if you have a story to tell. For several months I have been suffering from interference on 80 metres (3.5 - 3.8MHz) and 160 metres (1.81 - 2.00MHz), with the worst effected being the 160m band. The level on 160m has varied, and has been at times, stronger on my inverted-L 160m antenna. Most recently [the interference] has been stronger on the 80m dipole, which is along the southern boundary of my property. As there are a greater number of properties adjacent to this antenna, my search started in this area. The interference had the characteristic 100Hz rasping noise (2nd harmonic of 50Hz) associated with mains powered equipment, plus products spaced at regular intervals typical of switched mode systems. At first I suspected it might be a television receiver power supply at one of the houses near to the antenna. However, it was discovered that it was on 24 hours a day, so unlikely to be a TV or similar device in a residential property. One of the nearby properties is a café and this where my search started. Using a small Medium Wave radio that had been modified to cover 160m, I discovered an extremely strong rasping interference at the rear of the café. This could also be detected at the front and side of the premises. The café has a chilled display cabinet with fluorescent illumination and I suspected that this was the source as this was the only device that appeared to be powered permanently. 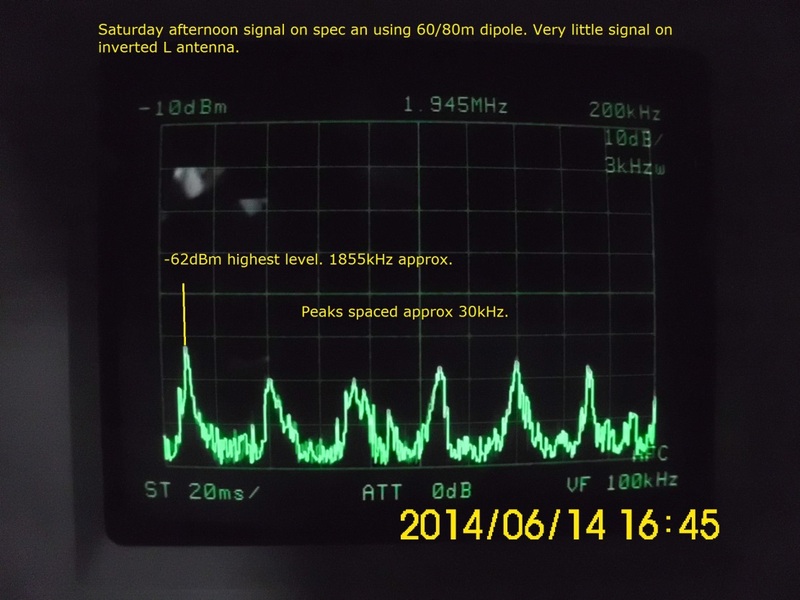 Fig 1: This was the signal level on my 80m dipole in mid-June. Following the advice regarding interference on the RSGB website, I submitted details of the interference to Ofcom. I submitted the complaint online and received a call at 20:00hrs in the evening of same day. The caller explained that he was at the Baldock control centre and said that I had to agree to the Ofcom terms regarding charges, should the interference be found to be within my control. I explained that I had already ensured that the source was external to my property, having isolated my mains and Solar PV system whilst monitoring the interference on a battery powered receiver. He said I would receive an email and my reply to this would be taken as my agreement to the Ofcom terms and conditions. The email was replied to the next day and by mid-afternoon I received a call from the local investigation officer at the Ofcom office for the NW of England to make an appointment. On the first visit the officer was given a demonstration and one of the strongest emissions in the 160m band was chosen. He took his portable receiver in to the café where he initially met some reluctance by the café owner to co-operate. After a while he was able to overcome this and she agreed he could make a return visit at a time when the café has fewer customers. On this first visit an emission was proved to be coming from the lighting unit in the chilled display cabinet, stopping when the lights were turned off. My interference level had not changed at all, indicating that this was not the source I was receiving. A return visit was agreed upon when the café owner would be happy to switch off the mains supply. On the return visit the café mains supply was isolated. This had no effect on what I was receiving, despite the existence of a strong field of broadband interference at the rear of the café when the café supply was on. The interference sounded identical, however this was obviously not radiating as much of an E field (electrical) as I had thought and must be a predominantly local H field (magnetic). The Ofcom officers carried out further tests in the area that day and visited several premises but without success. They would however return and continue the investigation at a later date. In the meantime I continued to wander around the area with various receivers listening to all the various noises in the MF spectrum ... despite the strange looks from neighbours and passers-by. Using another one of my MF receivers, I noticed that I could receive the interference at a side wall of another neighbour’s house, and this time paid more attention to the spacing and amount of products. The signals on my FRG7 had been carefully plotted and all the individual frequencies noted. 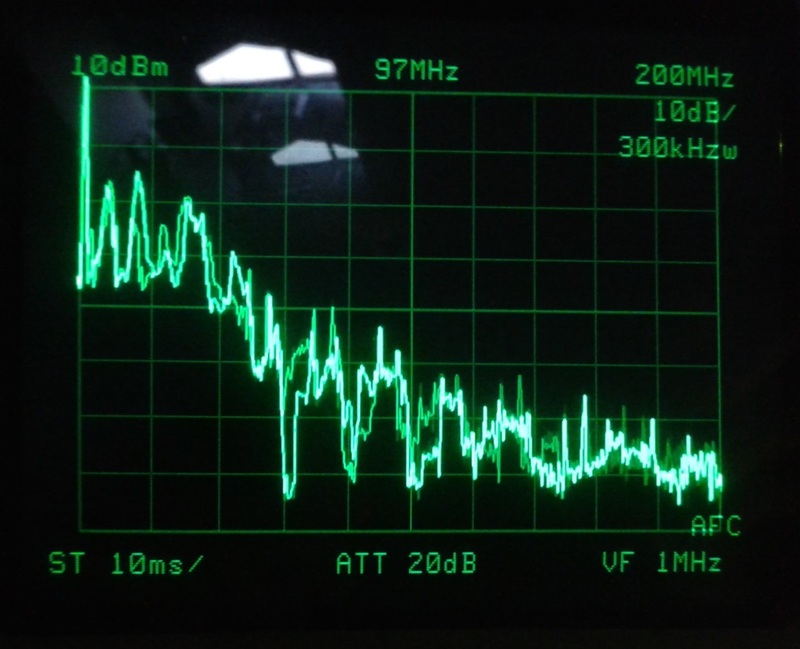 In the main the products were spaced about 70kHz, with odd ones heard in between. I was certain that this was the exact signal, but its reception might just be enhanced by my proximity to wiring or metal structure in the house - an effect that I had experienced many times and been misled by whilst wandering round the locality with my receiver. As luck would have it, my neighbour had just arrived and I asked if I could just do a quick test in her house. She was now quite used to seeing me wandering about with various devices listening to noises and had no objection. I did not expect this to reveal anything new but this was clearly the identical signal I received in the shack and it was worth pursuing. To my surprise, the level of the signal increased dramatically in the distance of two or three metres as I neared the centre of the property, and was strongest against the party wall with the next house. I had been around the perimeter of the building many times myself, and also with the Ofcom officer, and never heard anything significant, but this was extremely strong. Just to prove that the source was not in that house, I asked permission to switch off the mains at the consumer unit. The signal was still there with the mains supply off. I returned later with my Spectrum Analyser, having made up a simple Ferrite tunable antenna specifically for use with it. The signal was definitely coming from next house! I informed the Ofcom officer of the latest developments and he asked if I could gain the householders’ permission for him enter the house on the next visit. This was done, and whilst there, I took my small MW radio into the house to demonstrate the effect. The signal was very strong on this side of the party wall but nothing obvious could be seen that might be responsible. The householder confirmed that she was happy to allow tests to be carried out by Ofcom in several days’ time. Fig 2: The interfering signal, measured using a Ferrite Rod antenna inside the house next door to the source. Several days later the Ofcom officer and I called at the house with test-receiver and Spectrum Analyser in hand. The first thing the Ofcom officer asked was: "Do you have a laptop charger or similar device?" The householder said, "Yes we got it last year after the dog chewed the original one. This is a replacement for the Acer charger and it is left plugged in all the time!" (Not ideal if the device overheats and starts a fire - Ed.) The device was plugged in on the floor in the corner of the front room at least four metres from where the signal was strongest. As soon as it was unplugged the interference stopped. 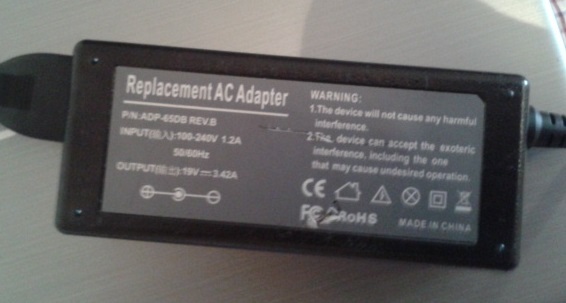 Fig 3: The offending charger, note the Warnings regarding interference! The charger is obviously a cheap copy and was suspiciously light in weight compared with the genuine chargers, suggesting a lack of EMC components! It has two warnings on the label; the first one states: The device will not cause any harmful interference. So no problem there then! What the second warning means is anybody’s guess: The device can accept exoteric interference, including the one that may cause undesired operation. We can only assume that this is the manufacturer’s interpretation of "self certification" and the justification for the CE marking. The Ofcom officer asked the householder to provide any information she had regarding the purchase of the charger. I assume they will pursue the supplier/importer? He also advised her to source an original or a compliant equivalent, which surprisingly she agreed to. This has been an interesting episode and illustrates just how difficult it can be to trace some forms of interference, especially when other sources can lead you astray. I have not solved the mystery of the strong emission at the rear of the café, which varies considerably from day to day, but will keep monitoring it. Top band (160m) and 80m are a lot more pleasant to listen to. I still have a lower level interfering signal on 1942kHz which I suspect is coming from the café, and was probably the signal heard by the Ofcom officer on his first visit which went ceased when the chiller cabinet display lighting was turned off. As this is way below the level of the main source of interference it would explain why I did not notice any change on my shack receiver at the time. I also realise that this would be a difficult source to eliminate. Fortunately it is only one signal and is at a low enough level that I can cope with it. 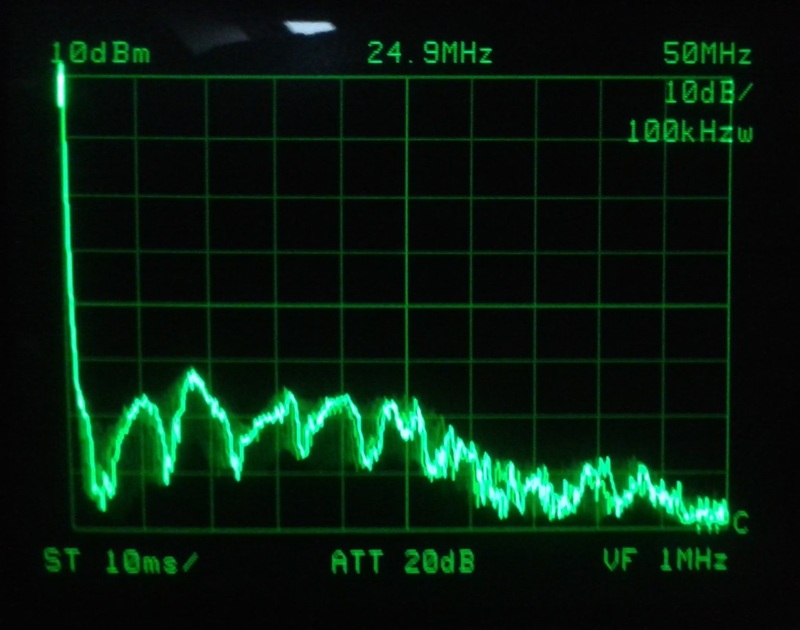 What is still a bit of a mystery is the characteristic difference between the signal measured on the antenna in Fig1 where the products are approximately 30 kHz apart and that in Fig2 where the products are some 70 kHz apart when measured close to the interference. It will have to be assumed that this is due to the characteristics of the emissions and associated radiation mechanism. I am very impressed with the response from Ofcom. Whilst some of the criticism that has been made in the past regarding policy decision and PLT was probably justified, the service provided by the Radio interference investigation staff is excellent. This has also been the experience of colleagues of mine who have had similar issues connected with amateur radio. I sincerely hope that Ofcom do pursue the suppliers of such equipment, especially given that the general public are largely ignorant of EMC issues. I often think that it is a pity we do not have a better system for disseminating public information on EMC matters, but it is hardly surprising when we see the poor knowledge and attitude displayed by politicians on this subject! December 2014 This interference was first noticed on a nearby FM receiver tuned to Radio 3 on 91.5MHz. As the distance between the victim receiver and the source was approximately 4m it was ignored as at that point no other problem had been noticed on MF or HF frequencies, so it was assumed to be due to the close proximity and the fact that the cable to the lamp was on a catenary that passed over the location of the receiver in a conservatory below. 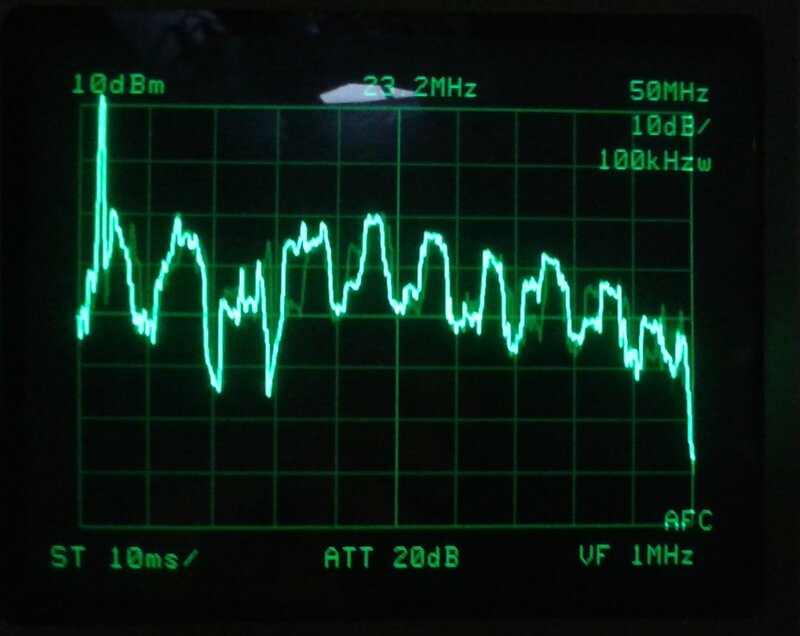 At a later date, whilst aligning an HF receiver some 15m away from the source, a problem was encountered in that the signal-to-noise ratio appeared to degrade then suddenly improve for no apparent reason. Cabling between the receiver and the Signal Generator was checked for intermittency but proved to be good. This effect was only observed on the higher frequency range of the set, and as it was now dark outside, a check was made to see if the LED floodlight was on. Sure enough the LED lamp was on and the noise was apparent on the RX audio. The LED lamp turned off and the noise disappeared. It was sufficiently strong to be received on the interconnecting cable between radio-set and Signal Generator. The same interference was noted on my early morning 80m scheduled contact with a station whose signal is always readable, but now was impossible to copy. The LED lamp is a 10w rated device and comprises a surface mount LED and Switched Mode Power Supply Unit (SMPSU) which is built in to the lamp housing. There are no maker’s names on the lamp and the only marking on the SMPSU module is a "Quality Control" stamp. The device did have a CE mark on the packaging but has no mark on the lamp casing. This was purchased from a small independent local electrical shop and as yet I have no other information. 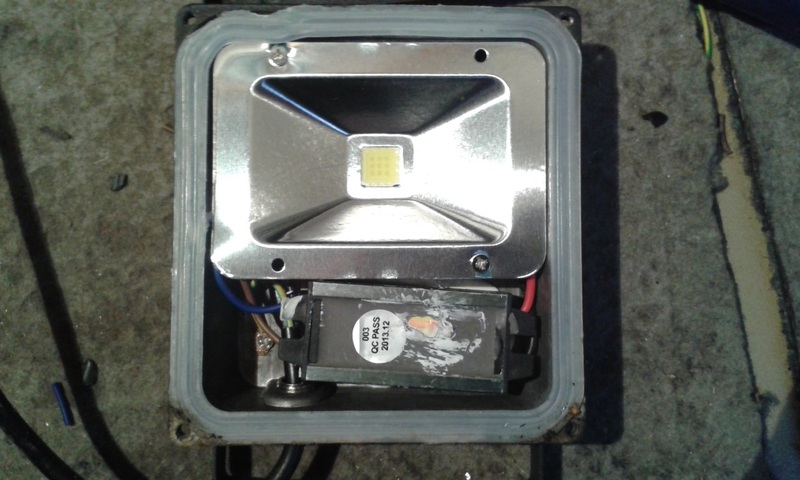 A replacement was sought and purchased from B&Q, which is made or imported by Smartwares Lighting of Bromsgrove. The type is XQ–Lite No. XQ1162B, is rated at 10w, and features a PIR sensor. When opened up to connect the supply cable the SMPSU module can clearly be seen. It has its own CE marking and is an Elux 24-35V 350mA constant-current unit. A simple Line Impedance Stabilising Network (LISN) was made up, similar to the type required for CISPR standards testing. It must be understood that this LISN is not intended to provide measurement accuracy to laboratory standard and is only sufficient for a comparative indication against a similar lamp that is believed to be compliant. Prior to installation the new device was attached to the LISN. 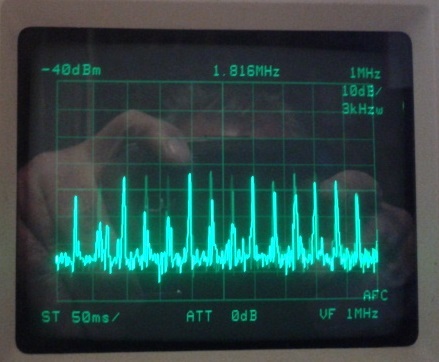 The Spectrum Analyser display can be seen in Fig1. There is little significant conducted emission above 30MHz, which would tend to indicate far better EMC filtering than the original. The original device was then connected and the results can be seen in Figs 2 & 3. Fig 1. Conducted emissions from the new B&Q lamp. Note: that the large spike at the start of the trace is the Spectrum Analyser local oscillator feed through signal and not an emission. Fig 2. Conducted emissions from the original lamp up to 50MHz. 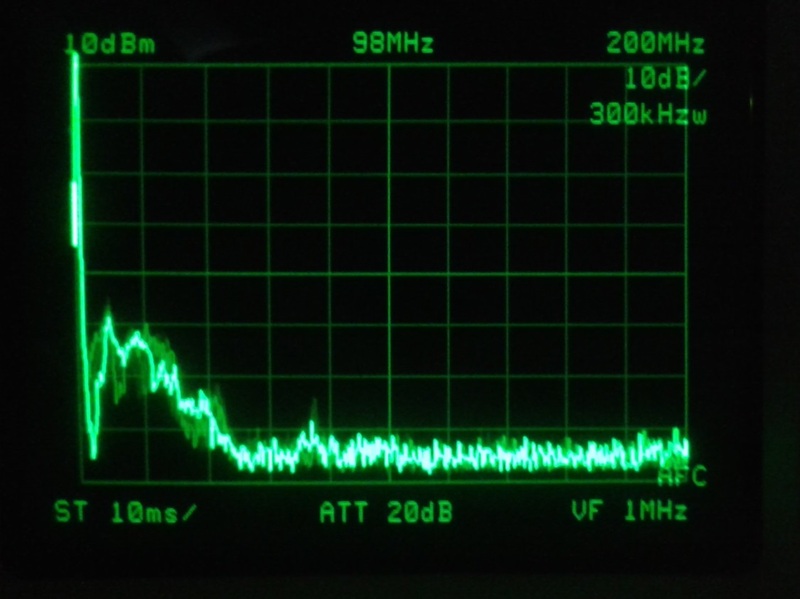 It can immediately be seen that the level up to the 25MHz region is some 40dB higher than in Fig 1. And in Fig 3 emissions are present up to 200MHz. Fig 3. Conducted emissions from the original lamp up to approx 200MHz. Fig 4. The original lamp and its SMPS module. Fig 5. The crude LISN and original lamp (with cover fitted). The lamp was obtained from a local electrical retailer and did not have any manufacturer's labels or CE mark. However, I did recall that the original packaging had a CE label, but this was long gone. I approached the retailer and he gave me the suppliers details. I contacted the company, who are a wholesale distributor. The company proprietor told me that although he imports from China all the products are compliant and this one must have been an earlier model. He said that he would replace it and went on to tell me that he has a UK EMC lab perform random checks on the products he has made and tested in China. I was surprised and pleased at the response from the supplier and did not expect such awareness of EMC. I returned the lamp to the retailer and thanked him for the contact details he had given me. I explained what had been said, and based on this, he was happy to give me a replacement, returning the original to the supplier. The replacement lamp was tested on the LISN and the results can be seen in Figs 6 & 7. 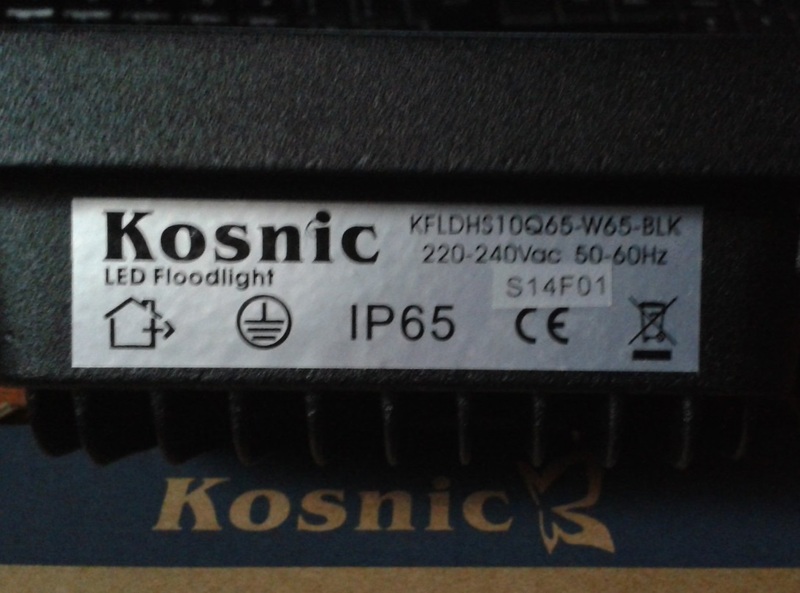 The replacement lamp is manufactured by Kosnic, the LED is a 20 LED array, and the SMPSU is a non-potted circuit board enclosed in a Heat Shrink sleeve (figs 8 & 9). Fig 6. 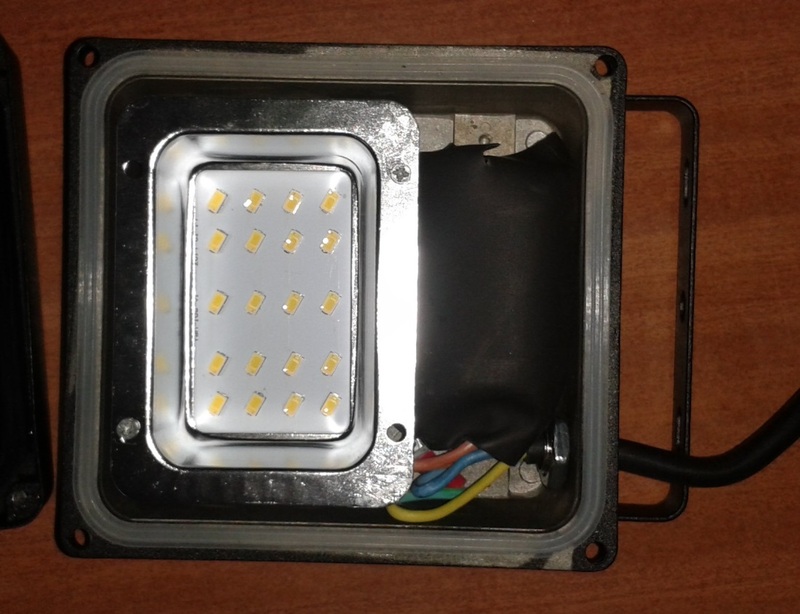 The replacement lamp emission up to 50MHz. Fig 7. The replacement lamp emission up to 200MHz. Fig 8. 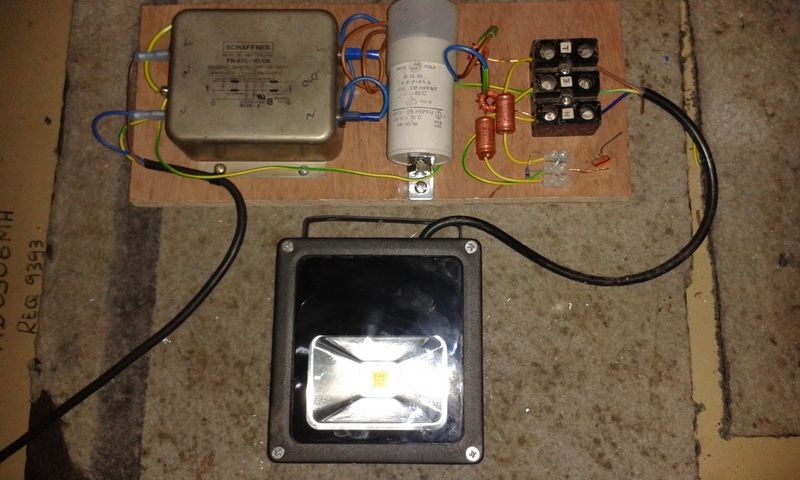 The replacement lamp LED array and SMPSU. Fig 9. Replacement lamp labelling. Brian's experience is consistent with the findings of the METECC LED Lamp Investigation. I had been interested in shortwave radio listening since I was a lad in the '50s so it was an obvious choice to take up again when I retired. This true tale tells of how interference from a plasma TV made it impossible for me to listen to a large chunk of shortwave when the TV was turned on. What made it worse was that it was my TV and I had only recently bought it. You might say "why don’t you turn off the TV then? ", but you will understand it was my wife who was doing the watching. I had kept an interest in radio over the years and had collected equipment, but never had anywhere to set it all up. When retirement came in February 2011, we moved to our new place in High Peak, Derbyshire, and I decided that I would build a listening post in the garage. By autumn, with the help of an old school friend, I had my rather cosy, fully insulated room of 2 x 2 x 2 metres, with two desks, twelve mains sockets, and a heater. I set up the room with my kit and built and erected some antennas. Things were going well... Come September 2011, my old TV was on its last legs, so I splashed out on a large screen plasma TV, which arrived in time to watch the World Cup Rugby tournament. In hindsight, I could have done without seeing England’s demise in such wonderful detail! Over the winter, I was predominantly listening during the day and did not really notice too much specific QRM (man-made noise). By the spring of 2012 I was hooked again and listening in earnest. I started to listen in the evening, when more exotic and distant broadcast stations can be heard. It was then that I noticed horrendous noise across a large part of the shortwave spectrum. I had come across noise before, so knew that when it was bad, there was no alternative but to give up and turn off for the day. The problem was making my night-time listening impossible. I had noticed in a radio magazine a noise cancelling speaker (DSPKR from BHI) which seemed to hold out some promise, so in September, I purchased one. It turned out to be great for significantly reducing the natural noise (QRN), but the noise I was getting was hardly touched. It was around then that I realised the noise I was suffering had some pattern or modulation to it and must have been coming from some local electrical or electronic equipment. I have a small portable shortwave receiver with telescopic antenna which was quickly pressed in to service. I walked around the house with it testing for the proximity of the noise source. I found a mobile phone charger that produced a large amount of noise as I approached it. I found that this noise travelled around my home mains circuits and into the garage and my listening post. This was easily solved: I unplugged the charger. It was not until a few weeks later that I happened to be listening on a portable when my wife turned on the TV. As soon as the TV picture came on, so did the interference. I walked outside with the portable and could pick up the interference from over 25 metres away. 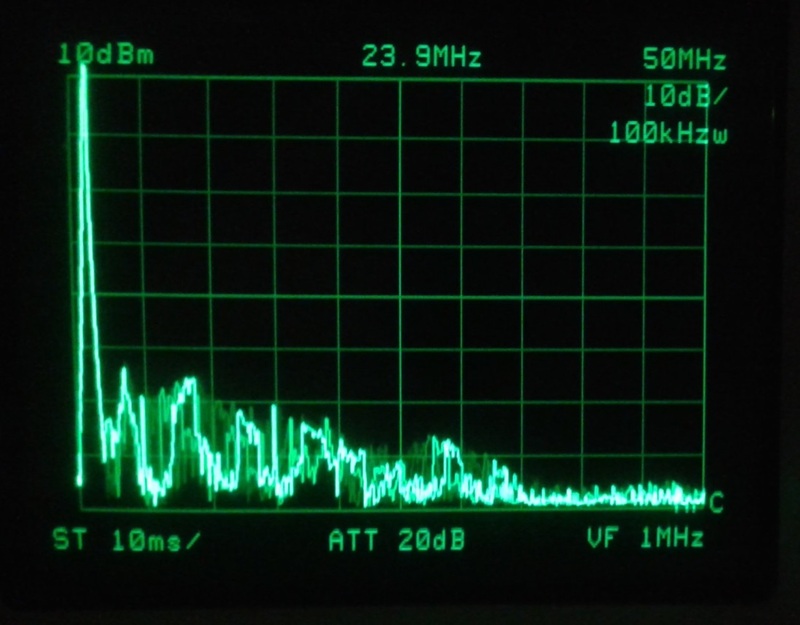 The noise covered from at least 4 to 15 MHz in the shortwave bands, and using an audio spectral display, I was able to see a comb of frequencies over the top of the station I was trying to hear. In November 2012, I made email contact with the Panasonic customer care line and explained the problem. They suggested some tests, such as removing everything plugged into the TV set and seeing if the problem still occurred. They wanted to make sure there was no interaction with other equipment and that the noise was not being sent up the TV antenna or satellite dish leads. The noise was still there, and at the same levels as before. After much to-ing and fro-ing with Panasonic, by February they declared that they were unable to determine the problem and I should contact a Panasonic dealer. I was lucky enough to find David Fox at a dealership in Sheffield. David is also a radio amateur (G0BJP). He asked me similar questions to Panasonic and even sent me some ferrite units to clamp around the TV mains lead to see if interference was conducted into the mains circuit. If it was, the ferrites should have reduced the problem significantly; but it did not reduce it one jot. So the noise was being radiated from my TV and was being picked up by my radio antennas connected to my kit in the garage. David carried out some tests of his own and confirmed it was a common problem with all plasma TVs; and he had no solution to the problem. Looking around for some way of reducing the noise, I had read an article about active magnetic loop antennas, which were said to be good low-noise devices and can be rotated to "null-out" QRM. What this means is that the strength of the signal received by the loop changes with direction (known as directivity) and falling to a low level or null when broadside-on. I was getting quite desperate so I purchased a Wellbrook ALA1503 loop. Fortunately with shortwave signals, the direction that they reach the loop is not too important, but close-by interference such as mine, in theory, can be reduced. The loop could reduce the noise to around a thirtieth of the un-nulled level, but this was not good enough yet. The radiated interference must have been getting to my antenna from other directions, perhaps bouncing off nearby structures? Searching on the Internet, I found that the RSGB (Radio Society of Great Britain) were well aware of plasma TV problems and regional advisers were available to help. I contacted Graham Eckersall, a radio amateur (G4HFG / W4HFG), in February. From his questions, and some further tests, he was able to confirm David’s and my findings. He pointed out that although the topic of radiated emissions from plasma TV or other equipment is covered by the EMC (Electro-Magnetic Compatibility) Directive, he would be surprised if mine had not been tested and found to comply. These regulations cover conducted noise form 150 kHz to 29.999 MHz and radiated noise from 30 MHz to 6 GHz. My problem was from radiated interference between 4 and 15 MHz, and therefore not implicitly covered. However, he said, there was a general requirement on a manufacturer to ensure that their equipment does not cause interference. Legislation unfortunately seems to be open to interpretation. Graham suggested that I contacted Panasonic again stating I was acting on advice from an RSGB EMC adviser. In early March I spoke with Panasonic, informing them of what I had found with David and Graham’s help, and they escalated the matter. In mid-March, they got back to me and told me they had concluded there was nothing wrong with the TV; it met all the appropriate European EMC standards. They stated that as far as they were concerned, the case was closed. Perhaps the TV met the letter of the law, but it did not meet the spirit of not causing interference with other equipment. Graham was at a loss to know what to do next, other than modifying the TV at the end of a shotgun; then it would not cause any interference! I considered contacting Ofcom, who are supposed to protect the public from problems with consumer equipment suffering from interference from other equipment. They can investigate sources of interference and insist that offending equipment be turned off. However, when I looked at their website, I noted that if they found that the interference came from my property, they would charge me over £90/hour for their time. I would have had to pay for the privilege of Ofcom telling me what I already knew, and possibly insisting that I did not use my TV! It seems that they do not enforce the legislation put in place to protect the public, they merely penalise us for unknowingly having bought equipment that does not work as it should – interference-free. So there was no chance of help from Ofcom. The BBC Radio and TV Investigation Service (RTIS) are also meant to protect the listening public, but their website informed me that they would not pass a problem to Ofcom where "interference only affects non-domestic Radio and Television services, e.g. 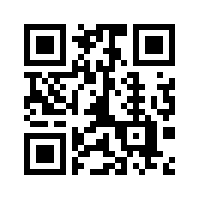 Shortwave radio services". So, there is no protection for me from the RTIS either. I was stymied again. My super wife voluntarily cut down on her evening viewing so I could get some listening in. This was far from an ideal situation! I also came across a second-hand "antenna noise cancelling unit" from MFJ. The idea here is to have a so called "noise antenna" close to the (QRM) source so that you have a high level sample of the interference, and to mix it with the signal from the main antenna of the station. Combining the two antennas in just the right way (by matching the noise amplitudes and having anti-phase conditions) it is, in theory, possible to cancel the noise and leave just the wanted signal. With careful adjustment, I was able at times to achieve significant cancellation and almost eliminate the TV QRM. Unfortunately though, I was unable to retain this cancellation for any length of time. I was spending more time trying to cancel the QRM than I was listening to the stations! Towards the end of March, I came across the UKQRM Yahoo forum and applied to join the moderated group hoping to find possible further ways of reducing the interference. To join, I needed to convince the moderator of my reasons. When I explained my problem to the moderator, Ken Underwood, he was more than happy for me to join. Ken is a radio amateur (G3SDW) and also an RSGB EMC adviser. He said he had had success in convincing plasma TV manufacturers to replace offending units with non-QRM sets and that he would help me in my problem. I have to admit that I was sceptical that Panasonic would budge. Ken gave me the name of someone within Panasonic to contact and press my case again. When I rang, I was unable to get the person I wanted to speak to, and the customer care adviser repeated there was no more they could do. I asked him if I would have this problem with an LED/LCD TV, and he said I would not. This was about as close as they would come to admission of a problem with plasma TVs. Ken was up in arms with their response and emailed his contact directly. After some time having had no response, he contacted the Managing Director of Panasonic UK. I do not know what persuasive powers Ken employs, but at the end of April, Panasonic offered to replace my plasma TV with an LED/LCD set. This arrived at the beginning of May 2013 and I can get back to enjoying my retirement hobby in peace. And most importantly, my wife is happy too, and can now watch TV whenever she wants. I am most appreciative of the people who have helped me, and who feel so strongly about the loss of the radio spectrum to poorly conceived or designed noisy equipment, that they would try in any legal way possible to get the manufacturers to put things right. The sad moral of the tale is, that despite there being legislation, Ofcom and the RTIS that are meant to protect the public, it was private individuals and groups that solved my problem. Clearly there is something fundamentally wrong with this state of affairs! As a footnote, a few weeks ago I heard that Panasonic are ceasing development of plasma TV, so this source of radio pollution will hopefully soon disappear!